Yahoo Inc. provided Chinese authorities with information about one of its users that was used to jail the man for eight years, an activist group said, marking the second time Yahoo has been accused of helping authorities jail a Chinese user. Yahoo's Hong Kong unit provided information about Li Zhi, a man from southwestern China who was sentenced to prison in 2003 on subversion charges after posting comments online criticizing official corruption, Paris-based Reporters Without Borders said. A Yahoo spokeswoman, Mary Osako, said the company didn't know of the case and couldn't comment on whether the Reporters Without Borders account was accurate. However, Osako said Yahoo Hong Kong would not have had access to Li's Chinese account and that it never releases information to the Chinese government. Osako said the company was investigating whether Yahoo China — which is now operated by a partner company — released the data. The claim comes as U.S. lawmakers are holding hearings on the activities of U.S.-based Internet companies that are cooperating with censorship efforts by China's communist government. Activists criticized Yahoo last year after it was disclosed that the company provided information that Chinese authorities used to convict and jail reporter Shi Tao last year on charges of revealing state secrets. "Now we know Yahoo works regularly and efficiently with the Chinese police," the Reporters Without Borders statement said. The group called on Internet companies to use U.S.-based servers for service in "repressive countries" so that governments have to comply with American law when getting information on users. Osako said when the company receives government subpoenas, it generally isn't told what the information will be used for. She said attorneys respond by turning over only the information that is legally required. "The choice in China and other countries is not whether to comply with law enforcement demands for information," Osako said. "Rather the choice is whether to remain in the country." 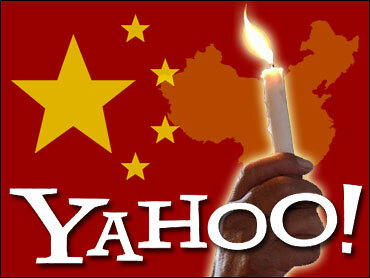 Yahoo was "distressed" when it learned of the facts surrounding the Shi Tao case, she said. Osako said that in the Shi Tao case, Chinese authorities demanded information from Yahoo's China unit, which complied with Chinese law. She said earlier accounts that said the information was supplied to Chinese authorities by Yahoo's Hong Kong arm were incorrect. Google Inc. and Microsoft Corp. also have been criticized for enforcing Chinese censorship guidelines. Google's China-based service limits online searches for sensitive topics and Microsoft shut down a Web log of a Chinese user at the demand of China's government. Yahoo formed a partnership in October with Chinese firm Alibaba.com, which has taken over running Yahoo's mainland China operations. An Alibaba spokesman, Porter Erisman, said Thursday the company had no information about the 2003 case because it occurred before the partnership was formed. Alibaba Chief Executive Jack Ma, told reporters in November that his company would cooperate with the communist authorities if they sought information on "politically sensitive information" sent by a Yahoo e-mail customer. The House of Representatives Committee on International Relations has scheduled a Feb. 15 hearing on the ethical responsibilities of companies doing business in China. Yahoo, Google and Microsoft Corp. have said they plan to attend.